What is Pro Performance AMP Ripped Vitapak Program?Athletes today are developing their speed, athleticism, muscle performance and complete physical potential faster than ever before. The ability to maintain a lean, ripped physique requires absolute fine-tuning of your sports nutrition regimen to enable the body to burn more calories, metabolize fats and achieve the best possible results from your training. 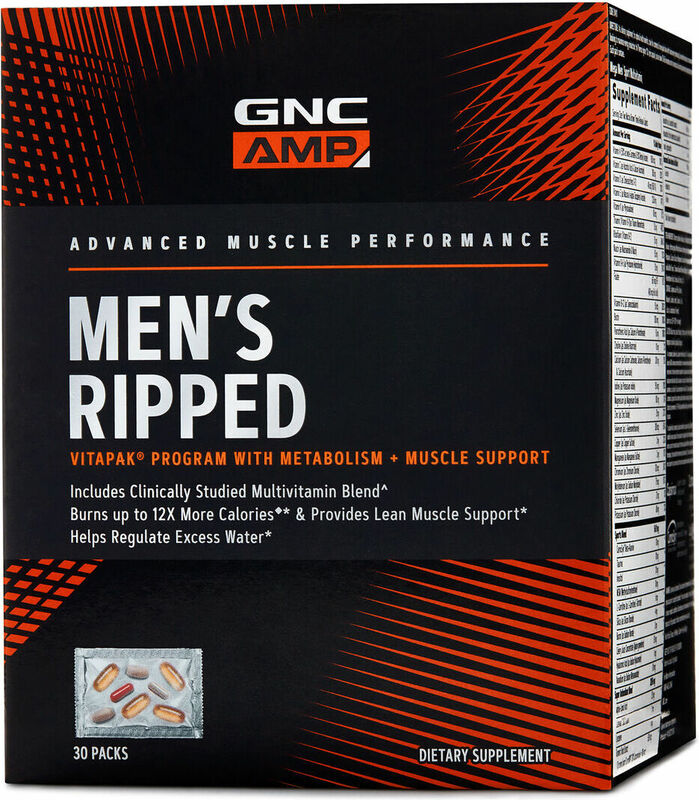 Championship athletes know that you must have an effective, targeted and balanced nutrition regimen to achieve maximum training benefits, GNC Scientists have created the breakthrough Pro Performance AMP Ripped Vitapak Program. 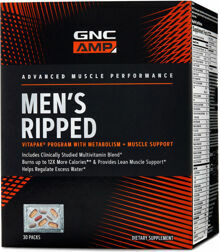 This unparalleled, powerful program combines a daily premium multivitamin, sports nutrients and clinically studied ingredients to fuel an athletes' physique repartitioning efforts. The Pro Performance AMP Ripped Vitapak Program EvolutionNow you have the ability to overcome regular training limitations through the all-new Pro Performance AMP Ripped Vitapak Program. This elite breakthrough program is designed to maximize training effects, enhance calorie burning and support lean, toned muscles to achieve a healthy body composition. *Most athletes today are not utilizing the proper combinations and ratios of critical sports nutrition. This system features potent supplements used by elite athletes and supplies what the muscles need to fuel intense training designed to deliver the ripped, lean body athletes want. Conjugated Linoleic Acid (CLA) – Features 4 grams of CLA clinically shown to support the lean, toned muscles for a healthy body composition that elite athletes push to achieve. * CLA is a naturally occurring fatty acid that is present in fatty foods many athletes cut from their training diet programs. Thermo Igniter 12X- Push your performance to higher levels, increase energy and speed up metabolism. * This clinically proven, proprietary thermogenic blend has been shown to help you burn 12 times more calories* and increase your metabolism before , during and after exercise. In addition, just one capsule supports improved endurance and performance to help your body work longer and harder than ever before.